Could an early bloomer also be a late bloomer? How many stars dominate at a young age, and as they grow older, find the inspiration to bloom again, into a different kind of star? From a star young player, to an inspirational veteran, and now planting the seeds of a potential coaching career, Maharashtra’s Manisha Dange hopes to do it all. Three months ago, Manisha Dange and Shireen Limaye were playing on the same court on the same squad: the former a 30-year-old legend of Maharashtra’s women’s basketball; the latter had just turned 16 and was already being touted as the next big thing in women’s basketball in India. Dange, as the team’s captain, and Limaye, as the young, do-it-all sparkplug, led an exciting Maharashtra Women’s team into the Federation Cup at Raipur. Three months later, the faces are the same, but the roles have changed: it is the Youth (U16) National Basketball Championship in Nagpur, Maharashtra, Dange and Limaye’s home-court, and the Maharashtra team is captained by Limaye, who is the most experienced young star leading a group of girls who are relatively fresh to the big stage. But Dange is here too – staying involved with Maharashtra and her young teammate as the coach of the U16 side. 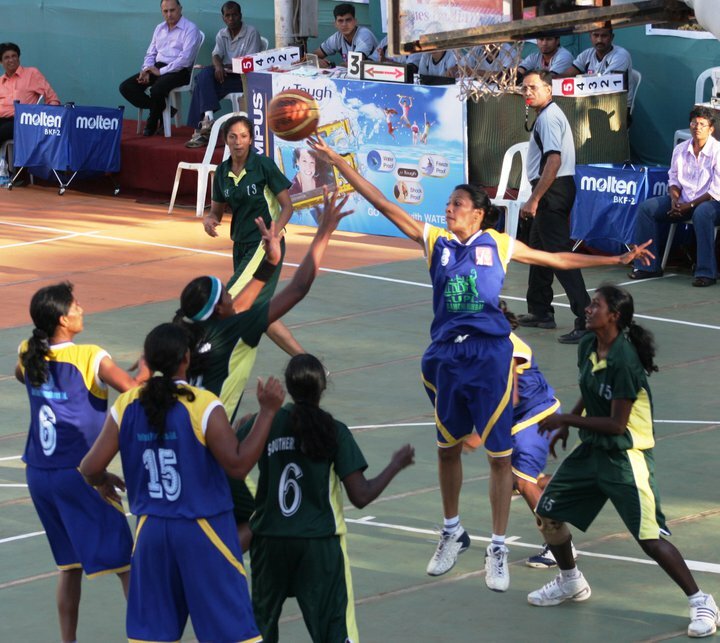 This is Dange’s second attempt at leading Maharashtra’s U16 Girls squad at the Youth Nationals – she was also the team’s coach last year when they went for the Nationals in Trichy, Tamil Nadu. This time around, the pressure to perform as hosts and as one of the most talented young teams in the competition is squarely on Dange’s side. The current Maharashtra Girls side also has a good size advantage and will hope to exploit it against most of their other opponents. As a player, Dange has been here and done it all before. Hailing from Thane in Mumbai, she picked up the game when she was only 12 years old, but didn’t make her first major Nationals until the youth/U16 stage, the same stage at which she has made her coaching debut nearly 15 years later. From then on, the game of basketball began opening several new avenues for her: she was picked to play for Railways at the age of 18 – a move she calls the ‘best moment of her basketball career’ – and she represented India in two crucial tournaments in 2007: the FIBA Asia Championships in South Korea and an Invitational Tournament in Kuala Lampur, Malaysia. Although she won’t be making a comeback to the Indian National team soon, she continues to be a dominating and respected figure in Maharashtra Basketball – besides, it is now the turn for her teammate/star-pupil to shine: Shireen Limaye has become the youngest player to get a call-up for the Indian Senior National Camp in New Delhi, and she will have a shot at making her own debut with India’s Senior National team at the 2011 FIBA Asia Championship in Japan this August. And if anyone can help them deal with the pressure it’s their experienced coach – after all, she has been there, done that, and is now back to bloom again. aka Hoopistani... I'm an Indian writer who loves basketball, books, and butter chicken. This blog is a mixture of creative writing, basketball, and India, usually all rolled into one. I contribute to NBA India, Times of India, SLAM Magazine, Ekalavyas.com, Scroll, SportsKeeda, Basketball Federation of India, and more. I co-host the Hoopdarshan podcast. Brandon Jennings to visit India! Muggsy Bogues - NBA's shortest ever player - comes to India!